The First World War may have have featured static battlefields and attritional strategies, but that doesn't mean the course of events from 1914 to 1918 couldn't have unfolded differently. Here are 11 events that could have changed the outcome of the Great War. 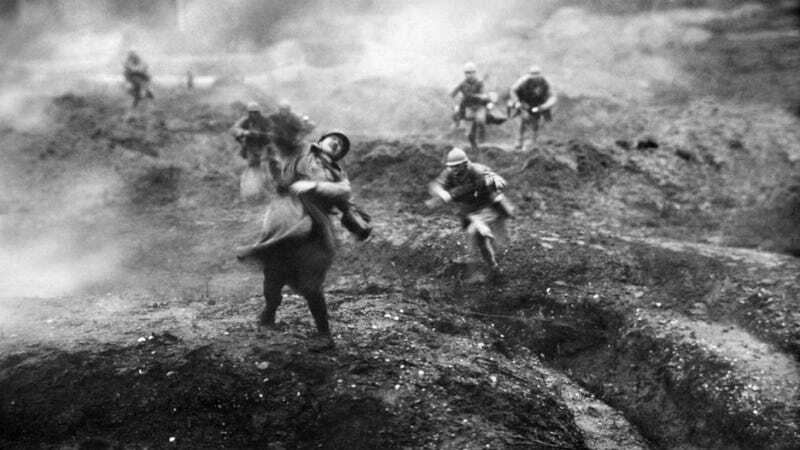 Top image: A French solider is shot during the Battle of Verdun, 1916 (Alamy). Listed in roughly chronological order. Had it not been for the Russian mobilization of July 1914, the Great War might not have ever happened. By rushing to the defense of its Slavic ally, Serbia, Russia set German plans into motion. Earlier, Germany had issued a "blank cheque" to Austria-Hungary, promising to come to its aid should Russia interfere with its efforts to tame Serbia. But after relations between Russia and Germany soured, and as Russian troops scrambled along the Austrian border, Germany believed it had no choice to but to roll out its Schlieffen Plan — a strategy wherein France, an ally of Russia, was to be defeated prior to launching an all-out assault on Russia; the idea was to prevent a war on two fronts, which is precisely what ended up happening anyway. Russia mobilized for several reasons. It was looking to re-assert itself after an embarrassing defeat to Japan in 1905. It was also the era of pan-Slavism, in which dreams of independent slavic states fueled aggressive foreign policies. But from a purely strategic perspective, there was no critical reason for Russia to come to Serbia's defense. The Tsar's actions turned a regional Balkan conflict into a global conflagration. But perhaps intentionally, it thwarted the plans of Austria-Hungary to expand its aging Empire into a tripartite state — the never-achieved Austro-Hungarian-Balkan League. As Europe prepared for war during the July Crisis, it was not immediately obvious that Britain was going to join in. But when the million-strong German army ploughed through neutral Belgium, Britain sprang into action, officially entering into the fray. Though it was scarcely ready at the time, Britain's contribution to the Western Front and the ensuing naval blockade on Germany proved to be decisive; France would have very likely fallen without Britain's help. British citizens cheer upon hearing the declaration of war. There are two scenarios under which Britain could have stayed out of the war. First, Germany could have avoided provoking Britain by not sending its army through Belgium and invading France directly (though Britain would have likely declared war anyway to protect its ally and critical northern ports). Alternately, Britain could have stayed out of the war simply for the sake of staying out of it. As historian Niall Ferguson argues, the intervention was "the biggest error in modern history." He concedes that Britain would have reneged on its commitments to uphold Belgian neutrality, but that realism in foreign policy has a "long and distinguished tradition, not least of which in Britain." This is one of the big "what ifs" of history: What if Helmuth von Moltke and his general staff had succeeded in reaching Paris in September 1914? Indeed, such an assertion is not altogether unreasonable. Some historians contend that the Schlieffen plan would have worked if Moltke had followed Schlieffen's original plan. Had the right flank not been depleted, Germany's 1st Army would not have been forced away from the sea, the British Expeditionary Force would have been overwhelmed, and the French armies would have been trapped between Paris and the French eastern frontier. With France fallen and the British routed, it's difficult to say what would have happened next, but it's safe to assume Germany would have given Russia hell out in the East. Unlike the situation 27 years later, Germany would have likely defeated Russia given the sorry state of its military. Together with Austria-Hungary, the two nations would have ruled over a massive European empire. What's more, a quick victory by the Central powers would have presented a terrible blow to democracy, while reaffirming autocratic political values. Indeed, the First World War was more ideological than many people realize. When war broke out in August 1914, Italy declared a policy of neutrality — this despite its previous alignment with Germany. Over the ensuing months, both the Entente and the Central Powers desperately tried to get Italy on their side, offering sweet rewards for victory. Italy bided its time, waiting for the best offer — and to get a better sense of who might actually win the conflict. Italy decided to join the Entente under the terms of the secret 1915 Treaty of London under which it was promised huge territorial gains at the expense of Austria-Hungary. Unabashedly, the Salandra government admitted that its decision arose from pure self-interest, or "sacred egoism." Italian troops head to war. But let's assume for a moment that the Central Powers were able to make a better offer, or that the Italian government honored its commitment to the Triple Alliance. With Italy on the side of the Central Powers, the war would have unfolded quite differently. Rather than having Italy fight against Austria-Hungary, the two nations could have joined together to clean up the Balkans and then launch coordinated campaigns against Russia on the Eastern Front. Some Italian troops could have also been sent to the Western Front, or help out the Turks. It's difficult to know if the war would have ended differently (probably not); Italian troops were plagued by poor generals, lack of experience, and a dearth of heavy equipment. One thing's for certain, though, the war would have dragged on considerably longer — perhaps long enough for the belligerent countries of Europe to suffer complete social and political collapse. In their rush to open a third front and quickly knock the Ottoman Empire out of the war, Allied planners launched a naval campaign in 1915 in the Dardanelles that, after failing to meet its initial objectives, regressed into the catastrophic Gallipoli Campaign, an eight month ordeal that resulted in 252,000 casualties on the Allied side — and for absolutely no gain. It was a military and political disaster that cost Winston Churchill his job as the First Lord of the Admiralty. Historians regard Gallipoli as a precursor to the Normandy Campaign of June 1944. But unlike Operation Overlord, the amphibious landing at Gallipoli was a haphazardly planned and ill-equipped venture. In his book, Gallipoli: The End of the Myth, historian Robin Prior makes the case that the campaign would have failed in any incarnation. ANZAC troops prepare to land at Gallipoli. But what if they had landed in Normandy instead? Like the invasion rolled out by Allied forces in the subsequent war? It's certainly a plausible suggestion. With the war stalemated along the Western Front, the Entente could have caused the Germans considerable problems by opening up a new theatre of operations in northern France. The British Navy maintained sea dominance during the war, and could have easily transported masses of men to the Normandy (or Callais) coast. The Germans, barring sufficient intelligence, would have been caught completely off guard. Admittedly, this is highly speculative stuff. Given the primitive state of technologies at this point in military history, and given what happened at Gallipoli, it's no guarantee this campaign would have worked. The logistical demands alone would have precluded such an invasion from happening until 1916 or later. Moreover, it would have been very difficult — if not impossible — to justify the diversion of resources away from the main theatre, and for the Allies to contend with Germany's superior internal line of communications (in this war of attrition, Germany would have been able to supply its troops at a considerably quicker rate). Yes, it was the Zimmerman Telegram that ultimately pushed the United States into the First World War — but a strong case can be made that, if it wasn't for Germany's U-boat campaign against its merchant shipping fleet, the U.S. might not have entered into the fray. Things were looking very bleak for Germany in 1917. 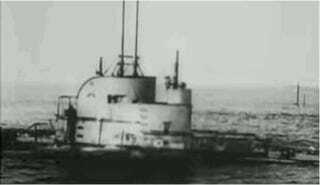 With victory on land doubtful, Kaiser Wilhelm renewed his push for unrestricted submarine warfare — an effort to crush the flow of merchant shipping to its enemies. As it retained a defensive posture on the Western Front, the supreme army command endorsed the German navy's opinion that unrestricted U-boat warfare against the British and Americans at sea could result in a German victory on land by the fall of 1917. Germany's prime minister, Bethmann Hollweg, feared that such action would antagonize the United States. He was right. If the U.S. hadn't joined the war, it would have dragged on for at least another year or two — or even more. There would have been no Michael campaign in 1918 — a last ditch effort by Germany to end the war before U.S. troops could make a difference — thus preserving Germany's fighting power. Peace could have happened at virtually any time during the war. In fact, it would have been prudent for Germany to push for peace terms after the First Battle of the Marne in 1914 — a truly decisive battle that ultimately set the stage for Germany's defeat. Molke himself knew Germany was finished even at this early stage, telling the Kaiser, "Your Majesty, we have lost the war." 1917 would have been another good year to call it quits. With no end in sight, with no prescription for ending the war, and with widespread social unrest, it would have made complete sense for any of the belligerent nations to say enough is enough and end the war. With the battle lines drawn, Germany would have extended its territory along the 440 mile long front. It would have retained its possession of Alsace-Lorraine, and become the permanent occupants of much of Belgium. In the East, Poland would have remained partitioned between Russia and the Central powers. A cold war would have settled in among the previously warring nations. But none of these scenarios ever unfolded. Germany's militaristic leaders found the prospect of a negotiated settlement appalling, as did many of France's leaders. Far too much had been lost at that point to simply call it quits. Victory was deemed necessary to justify and and avenge the sacrifices, regardless of the cost. Moreover, once the United States entered the war, victory for the Allies was all but assured. But that's not to say some didn't try to seek peace. After the death of Franz Josef, the new emperor of Austria-Hungary, Charles I, secretly approached France to negotiate peace, but nothing came of it. Germany's Ludendorff, when he learned of it, was so angry he actually considered declaring war on his ally. Unbeknownst to Germany, masses of French troops, fed up with how the war was going, conducted a large scale mutiny from April to May 1917. Imagine what would have happened if they launched an all-out assault during that small window of opportunity. A French solider is executed by his fellow troops. It all started after the failure of the Nivelle Offensives, and the catastrophe at Chemin de Dames in particular. French soldiers had been promised a breakthrough, but instead suffered a humiliating defeat. Weary from war, the soldiers left their posts one by one, demanding better rations and extended leaves. It wasn't a full-on refusal to fight; rather, it was a kind of work-to-rule action. At its height (and historians only learned this about this in 1967 thanks to the work of Guy Pedroncini), nearly 50 French divisions were affected. Of its 113 infantry divisions, 43% were experiencing mutinous behavior of varying degrees. 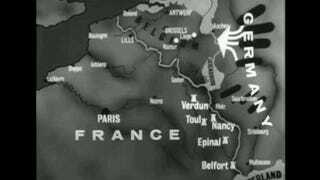 But the French government suppressed the news so as to not alert the Germans, or exacerbate the situation any further. General Petain managed to appease and calm his troops, and the situation was resolved. Had he not done so, a similar situation could have arisen in France that did in Russia, leading to widespread social unrest and revolution. Not only would this have changed the course of the Great War, it would have dramatically changed the complexion of the 20th century. Exhausted and demoralized from war, the Tsarist autocracy was overthrown in February 1917. A provisional government was set up under Alexander Kerensky, a moderate socialist who insisted that Russia would uphold its commitment to the war. But in an astounding stroke of genius, Erich Ludendorff transported Bolshevik leader Vladimir Lenin and his acolytes from Switzerland to Russia in a sealed train. Knowing full well that Lenin was opposed to the war, Ludendorff's hope was that he would find a way to assume power — and assume power he did by virtue of a coup in October 1917. 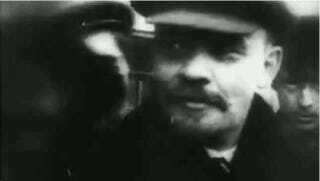 Platforming on the slogans, "Peace, bread, land," Lenin ended Russia's involvement in the Great War. 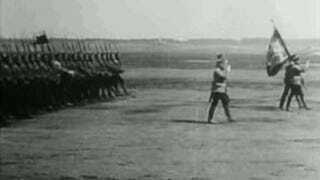 It was an astounding German victory, one that knocked Russia out of the war. Had Lenin not been sent to Petrograd, it's safe to assume that Kerensky would have continued the war, though under very difficult conditions. This would have forced the Germans to maintain sufficient forces on the Eastern Front — troops that were badly needed in the West. Ironically, it would be Adolf Hitler's Third Reich that, a quarter of a century later, would fall to defeat at the hands of the Soviet behemoth his forebearers created during the Great War. Troops with the Russian Provisional Government fire machine guns at revolutionaries in July 1917 in Petrograd. After the fall of Tsarist Russia, a sense of dread emerged across Europe. No nation was left untouched by the specter of socialist revolution, France and Germany included. Had the war been more poorly managed, and had soldiers and workers been pushed ever more so to the brink, these countries could have very well fallen to socialist — or even communist — revolution. This would have resulted in a vastly different outcome to the war and very different post-war Europe, indeed. Such is the fantasy of the "Stab in the Back" conspiracists who followed in the wake of the war. Confused and surprised by the "sudden" surrender, some Germans believed the country still had considerable fight left in them. It was earlier in the year, after all, that Operation Michael produced some of the most significant gains recorded by the Germans during the war. But it was only after much stubborn deliberation that Ludendorff and Hindenburg finally decided to call it quits in November 1918. With Germany stripped bare of its resources, and its population starving, exhausted, and entering into the early stages of an Influenza epidemic, the hawkish leaders finally — and reluctantly — surrendered. But what would have happened if they hadn't? What if they insisted on a Nazi-esque Götterdämmerung in a desperate fight to the finish? First, the war probably wouldn't have ended in 1918 (the campaigning season was coming to a close), but it would have most certainly ended in early 1919. 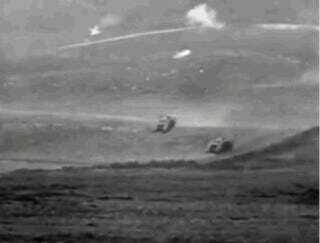 Allied troops, who were utilizing new combined operational tactics, were pushing steadily forwards. Eventually, they would have reached the German border, taking each town one by one until they took Berlin. It would have been a terrible mess, with mass soldier and civilian casualties on both sides — and for absolutely nothing. Yet it would be this myth — that the war was still winnable for Germany — that fueled the subsequent rise of the Nazi party.